DiS Meets Marissa Nadler: "If you don’t bare yourself, you risk not reaching people"
This is how DiS founder Sean Adams described Nadler’s recent London show, reprinted here because frankly, I’m at a loss to describe just how spellbinding she is. I’m lucky enough to catch her twice in the space of a week, in Amsterdam and Utrecht, and even those words struggle to convey the beauty radiating from the stage. There’s a spirituality at play, and a communal sense of something being shared, of important stories being told. But it’s not all paper light vocals and entrancing melodies; her music has a dark heart, an iron fist in a velvet glove that, when it connects – such as the epic ‘Drive’, or July’s centrepiece, ‘Dead City Emily’ – leaves you breathless and stunned. And through it all winds her voice, a wispy yet powerful tool that wraps itself around you, clings to your thoughts, and won’t let them go. Like her contemporary Sharon Van Etten – another heartbroken troubadour who’s finally receiving the critical acclaim her talent deserves – her music exists halfway between a dream and a nightmare; some tracks float right through you, carrying the charm of a carefree summer day, while others claw at your soul, heavy tales of romantic mess and broken lovers left on the highway of life. Adopting a more confessional, first person narrative – a change she attributes to growing up and maturing as a songwriter – has lent a sharper edge to her writing, but the gritty details remain, ephemera of a life lived passionately and the (sometimes sad, occasionally tragic) consequences of following your heart, not your head. It’s entirely deserving that such a creative zenith has led to a surge in popularity. Backstage in Utrecht, exhausted but elated, she beams with pride recounting the reaction thus far; her first sell-out UK shows, hordes of eager fans with handfuls of vinyl to sign, and an inescapable sense of reaching more people than ever before. She tells me how she’s “really paid her dues” – July is album number seven if you count official releases, number twelve if you don’t – and how happy she is to be back on proper labels after starting her own imprint and Kickstarter campaigns. “It’s very hard to get a self-release to reach beyond that built-in fan base you already have,” she told The Bay Bridged earlier this year. “And what people don’t realise is that I maxed out four credit cards to do it the right way.” With acclaimed independent labels Bella Union and Sacred Bones now behind her, such worries are a dim and distant memory. While she’s never really been away, this feels like something of a return; triumphant, and looking towards the future, Marissa Nadler’s time is now. DiS: Having self-released your previous two records, how has the reaction to July been now that you have labels to push it again? You’ve mentioned how hard it was to push beyond your existing fan base – is that easier again? 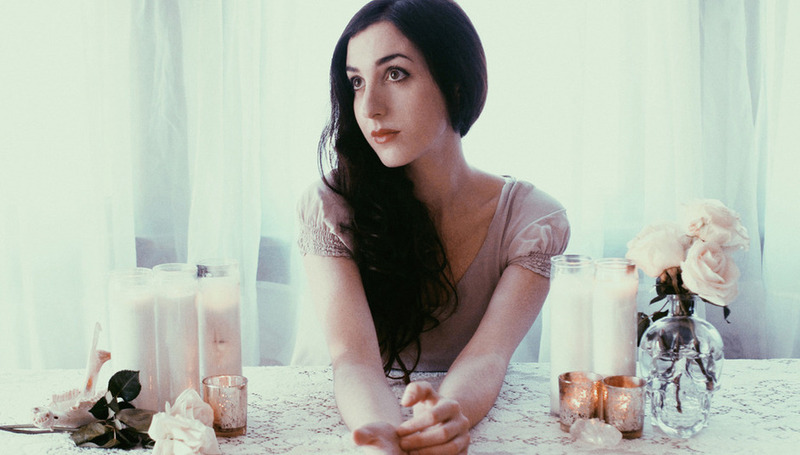 Marissa Nadler: Things have been great. Without a doubt, I’m finding the extra support a positive thing. I certainly don’t take it for granted either, because just like the song ‘Drive’, I've really paid my dues at this point in terms of touring for over ten years to small audiences. And now, I've done my first sold-out shows in the UK and I do think it's kind of a dual thing; the labels, plus the record…it was good timing that I happened to make a record people emotionally responded to and get signed at the same time, because I think it has to all come together in a nice way. I feel like I’m in a good headspace right now. Sacred Bones and Bella Union are both great labels, and I’m very happy to be working with them. Not many people would have you down as being a fan of the likes of Earth, or Sunn O))). What draws you to that style of music, and what parts of it do you try to filter into your own work? I definitely have a dark and heavy edge to my music, and that’s always been there. I think Earth and Sunn O)))) have the same thing; they may be heavy and I may be sometimes delicate, but it's just different vocabulary to the same emotions expressed. I don’t want to pin my music down as just one-dimensionally dark, but there’s definitely that there. You know, I met Earth many years ago. I was very lucky to get to meet Dylan [Carson], as I was already a big fan. My first records were put out on this mail order record label in Arizona – Eclipse Records, who are still going strong by the way – and they had a booking agent, Angela Means, who booked Boris, Earth, and me alongside some other heavy acts. So I opened for Earth for a few shows, and got to meet their bassist at the time, Jonas Haskins, who I still play with. Funny enough, Steve Moore from Earth plays a ton on my new album as well. Suffice to say, I’m a huge, huge fan. Great music for the land. So I got to tour with them and that’s how I came to really like them. I was actually hanging out with Stephen [O'Malley] last night in Paris, so it's funny that you mention Sunn O))). I read that it was Randall (Dunn, July's producer) who helped you introduce strings to the album, and you've also got some 3-part harmonies going on. What prompted you to try these things this time around? Well, the harmonies were all written before I went into the studio. A lot of my covers and lo-fi demos that I’ve home-recorded over the years have had a lot of overdubbing, and that was a big part of these songs, even in the writing process. I knew that that wasn't going to be a background thing, but a strong forward element. So on the record it’s my vocal over itself, but I didn't want to use a pedal live as I'm not really into looping for my own music – it doesn’t fit as well for me, although Grimes is the queen at that. So that’s why I made this band. As for the strings, it was Randall's idea to bring Eyvind Kang in. Eyvind lives in Seattle and is a very well respected composer. I just trusted Randall because I love what he does and I knew the songs were there; they had the harmonies, but the instrumentation was a group effort where he was like: "We should bring Eyvind in here" and I said sure. We just have a lot of the same tastes, so it was easy working with him. He also helped me use less reverb on the record, which I think helps people have more of an emotional reaction to the music. How did you meet Janel Leppin? Randall actually recommended Janel as well, and she's phenomenal – she’s really talented. She lives in Washington DC, which is an 8-hour drive from me. My touring band is an ever-morphing thing; I may add drums, and I may continue to change because sometimes people aren't available. The most important thing is that the song is there – I can play these all alone, but I like them better with the harmonies as part of the live sound; they don't really work alone as well. With this album, you sing a lot more in the first person. Is that because you are happier, or more content having a direct link between the stories and your real life, rather than hiding behind characters? I think I just grew up and became a more mature songwriter. When I was younger, on my first record, I was attending art school at RISD. I was unbelievably morbid for some reason, and fascinated with writing about death. I also wore black for about 15 years straight. Those were the days! Anyway, I was about 16 when I heard Nick Cave’s Murder Ballads, and that was very influential on me. As I got older, I just naturally started writing more [in the] first person. But, even in my early work, if there was some kind of “name” it was me, or someone I knew. The early songs are still very important to me, but now, there’s just less to cut through to get to the meat of the song. But it's a striking thing to just put yourself out there, laid bare, and say: "This happened to me, and this is how I feel". I think it's definitely weird for the people in my life. I have very, very few people in my inner circle, but I think it's weird for them to listen to July, because it’s just so exposing. But that’s part of the game of being an artist; if you don’t bare yourself, you risk not reaching people or expressing yourself properly. There are several references in the lyrics to excessive drinking. Do you feel that quitting alcohol has given you clarity in your art? To be honest, the clarity helped my song writing. To be clear, I’m still a bit shy, and for many years I was terrified of performing in front of people – I had confidence issues. I didn’t have much of a drinking problem outside of performing, it was being a musician on tour that did it to me – just the lifestyle of being backstage and so on. I stopped completely, and I think it’s made me more reflective – it put a wall up, like: "OK, that was then, this is now.” It can be difficult, like when people want to go out after shows and I just want to go to the hotel and watch TV or something. [I’m] Maybe not too rock and roll anymore, but a lot more emotionally stable. What is it about repetition and slowly evolving ideas that you love? Some of your tracks are almost like dance music in the way they swill around a few ideas until they become transcendent. All the songs on this record have a chorus, and they are deceptively poppy – I think they are pop songs in terms of structure, and there is a hook in every single song. That was a goal of mine. I'm very interested in the melodies being meditative, and sticking in people's minds. When you were growing up, which fictional characters were your heroes? Well, as a child, I was much more focused on fine art than music. I really thought my future was that of a painter. So, after reading “The Agony and the Ecstasy,” I was pretty interested in Michelangelo and the whole idea of being married to your work. I would hole myself up in the basement copying master paintings and listening to cassette tapes of Pink Floyd and Dirty Three. It sounds pretty romantic but I was kind of a wallflower, so there wasn’t much socially pulling me away from that. The work ethic of artists in the High Renaissance was insane – of course, it’s more complicated than that because of the whole “working for the church thing” – but my art tastes changed as I entered my teens. I became obsessed with Egon Schiele and his tragically short life and withered line quality. Giacometti and the poetic loneliness of his figures. I also had a major romantic love affair with the West; that’s not so much a hero story obviously, but more of a “place as a hero” type thing. I think because I grew up in the suburbs outside of Boston, I really loved movies like Terrence Malick’s “Days Of Heaven,” and artists like Townes Van Zandt. I thought Edward Scissorhands was pretty amazing too though. If you still remember the lyrics to every song you've ever heard, which ones are swirling around your head today? Dylan is a good way into that. Yeah, right? ‘Visions of Johanna’ was the first song that I really went for I think. I had a Blood on the Tracks songbook. I love that album. I was actually listening to ‘Buckets of Rain’ today, what a great song that is. Everybody always has their favourite Dylan record, and it's always some obscure one. And I'm like: "Really? Come on." What's so wrong about liking something that's so good? It's like people with Pink Floyd and Dark Side [of the Moon]; everybody wants to say Meddle or Animals is their favourite, but what’s wrong with liking the great poppy songs? Now that you are both on the same label, what are the chances of you collaborating with David Lynch? Oh my God, I would love to! I told Caleb [Braaten, Sacred Bones founder] that, but we'll see. I'd like to collaborate with Jim Jarmusch too…that would be insane! If you could write an alternative soundtrack for any of Lynch's films, which one would you choose? None. They are all perfect! You mentioned to Sean the other night in London that your next album might be a little louder, and a little heavier. Care to elaborate? Well, I'm definitely going to work with Randall again, and I think I'm going to start playing electric guitar, mostly for the sake of my fingers. Acoustics are always much harder [on your fingers] but we'll see what happens; I'm not exactly sure yet. Mainly, with writing albums, I don't write for a long period of time and then I go on a writing binge. I purposely don't write during my off period. I like to accumulate life experiences and bottle them up so that I can have some kind of explosion. That's what I did with July; I didn't do anything else except write that album when I was "writing." But I was very happy working with Randall, and very comfortable at Avast studios. I'm going to write the album first, and I have high hopes for it. Maybe I'll book the studio time now. So you don’t have any concrete plans in place? Probably wintertime will be when I start, because I'm touring up until then. I was asked to do a split 7" with XIU XIU, and I'd really love to work with SOMA sometime actually. There are a lot of people I'd like to collaborate with musically, so we’ll see what comes in. I would absolutely love to contribute vocals to some film soundtracks too. That's something that, other than making albums, I have a strong interest in for the future. July is out now via Bella Union.